...of Hall Farm, Kildale, a tenanted farm in the North Yorkshire Moors National Park extending to 880 acres (550 ac of heather and 320 ac of grass). The land ranges from 550ft. to 915ft. At the moment we carry 80 Luing cows and 200 Swaledale ewes, 150 of which are kept pure and 50 are put to the Blueface Leicester. Store lambs are bought in the autumn to graze grass; we will continue to do this until we have built up our cow numbers. I have lived in Kildale for nearly seventeen years, with Angie my wife and daughters Rachel (3) and Sarah (6 months). It is now nearly twenty years since I was at Oatridge College and met Robert McNee and his Luing Cows. We had a herd of mixed dairy bred suckler cows and increased our numbers quickly to benefit from headage payments and the opportunity we had from the estate of renting more land. This left us with almost 200 cows. Calving these cows gave us a lot of problems, in particular relating to health such as BVD and Rotavirus, and this along with the end of headage payments led to the decision to have a complete change and sell all our cows. I thought back to Robert's Luing cows and having never really forgotten them altogether I saw the chance to get to know them better. After some enquiries I was given Shane Cadzow's telephone number and from there things started to happen. In October 2006 we packed our bags, and I, Angie and Rachel headed for the Isle of Luing. We had a lovely time there and came away with our first Luing cows. There were twenty three cast cows and eleven bulling heifers. The following year we returned to Luing and came away with forty eight cows and six bulling heifers. The cattle had a high health status which we have managed to maintain, being BVD accredited and vaccinated, accredited for Johne's disease and vaccinated against Leptospirosis. 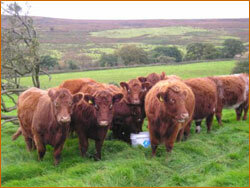 The cows start calving at the end of February with most of the heifers calving at two years old. We A.I. the heifers to Benhar Dynamite and followed up with a young bull, Benhar Harry, a son of Dynamite. The cows ran with a Simmental bull, Dirnanean Senator. This year the cows were split into two groups, with cows that were selected for best feet, udders and breed characteristics going to a new Luing bull, Attonburn Honourabull, which we had bought in Castle Douglas. The bulls are left in with the cows for nine weeks. Bull calves are left entire and get calf creep from August onwards. Calves are weaned in the middle of October with the bull calves finished inside on cereal based by-products. The aim is to sell them deadweight through Dawn Meats at twelve to fourteen months of age. The heifer calves are out-wintered on fields which are due to be re-seeded in the spring; they get silage and 1kg. of dry feed. The cows are out-wintered on deferred grazing until January when we start to feed them round bale silage on hard standing with a lay back on a dry field. Just before calving they are brought inside with the aim to have them back outside with the calf when it is two days old. Our goal is to produce a cow which is easily fleshed, naturally out-wintered and with ease of calving and a great temperament. All pure Luing heifers will be kept until we have around one hundred and fifty cows. We will continue to produce SimLuing bulling heifers for sale. The decision to change to Luing cows was one that I am sure we will never regret.